Corey Engen, was the youngest of three Norwegian Engen brothers. After a successful career as a nordic competitor in Norway, Engen brought his widowed mother to Utah in 1932, following his brothers Alf and Sverre. He quickly mastered alpine skiing, and moved to Idaho in 1937 to set up a ski program in McCall. He married Norma Bleak in 1938, then taught six winters at Sun Valley. 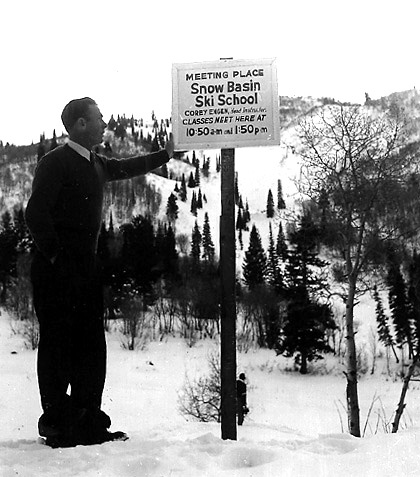 Engen returned to Utah after WWII to found the ski school at Snowbasin. Meanwhile, he competed in slalom and downhill events. He won the Alta Snow Cup three times and was a member of the 1948 U.S. Olympic team. He went on to win 22 gold medals in national master's and seniors competitions. He also coached the Weber State College team. Later he went to work for J.R. Simplot, developing Brundage Mountain. Engen was inducted into the U.S. National Ski Hall of Fame in 1973. His nephew Alan Engen told the Salt Lake Tribune that his uncle loved teaching skiing, particularly to children, and always had an affinity for the mountains. "When he moved back to Utah when his wife's health was failing, he moved to a location that was right under Mt. Timpanogos so he had a full view of its majesty."